The Gado Gado Left Carved Fish Drawer Pull HPU7025L (5 inch overall) in Antique Brass (HPU7025L) is part of the Gado Gado Collection. Other finishes are available using the item below. 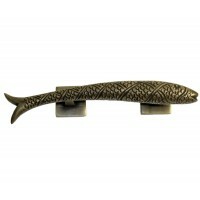 The Gado Gado Left Carved Fish Drawer Pull HPU7025L (5 inch overall) in Custom Finishes (HPU7025L) i..